Acid phosphatase (EC 3.1.3.2, acid phosphomonoesterase, phosphomonoesterase, glycerophosphatase, acid monophosphatase, acid phosphohydrolase, acid phosphomonoester hydrolase, uteroferrin, acid nucleoside diphosphate phosphatase, orthophosphoric-monoester phosphohydrolase (acid optimum)) is a phosphatase, a type of enzyme, used to free attached phosphoryl groups from other molecules during digestion. It can be further classified as a phosphomonoesterase. Acid phosphatase is stored in lysosomes and functions when these fuse with endosomes, which are acidified while they function; therefore, it has an acid pH optimum. 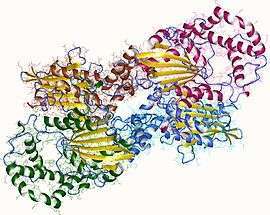 This enzyme is present in many animal and plant species. Different forms of acid phosphatase are found in different organs, and their serum levels are used to evaluate the success of the surgical treatment of prostate cancer. In the past, they were also used to diagnose this type of cancer. Reference ranges for blood tests, showing acid phosphatase in red at left. Phosphatase enzymes are also used by soil microorganisms to access organically bound phosphate nutrients. An assay on the rates of activity of these enzymes may be used to ascertain biological demand for phosphates in the soil. Some plant roots, especially cluster roots, exude carboxylates that perform acid phosphatase activity, helping to mobilise phosphorus in nutrient-deficient soils. Certain bacteria like Nocardia, can degrade this enzyme and utilize it as a carbon source. Tartrate-resistant acid phosphatase may be used as a biochemical marker of osteoclast function during the process of bone resorption. The following genes encode the polypeptide components for various acid phosphatase isoenzymes. 1 2 Henneberry, M.O. ; Engel, G.; Grayhack, J.T. (October 1979). "Acid phosphatase". The Urologic clinics of North America. 6 (3): 629–41. PMID 388794. ↑ Bull, H.; Murray, P.G. ; Thomas, D.; Fraser, A.M.; Nelson, P.N. (April 2002). "Acid phosphatases". Molecular Pathology. 55 (2): 65–72. doi:10.1136/mp.55.2.65. PMC 1187150 . PMID 11950951. ↑ Minkin, Cedrick (1982). "Bone Acid Phosphatase: Tartrate-resistant Acid Phosphatase as a Marker of Osteoclast Function". Calcified Tissue International. 34: 285–290. doi:10.1007/BF02411252. PMID 6809291. Retrieved 11 May 2015.